This blog posts excerpts content from the BHS Music Educator Guide and Songbook. 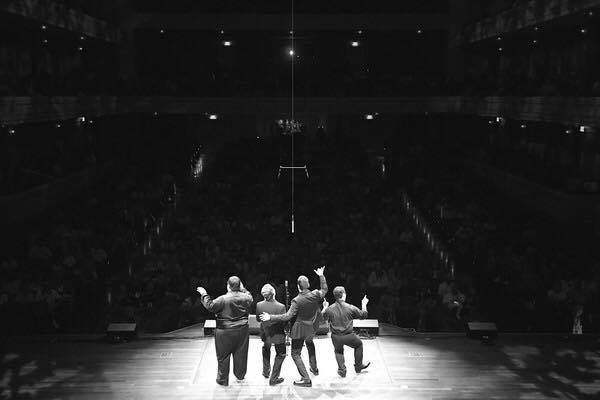 It is intended to address accommodating arrangements of tags written for male and female changing voice, but has a broader application when considering mixed-gendered barbershop singing. The coda of a song typically has a flourish of chord changes. These endings, called tags in jazz and barbershop, have become such an important part of barbershop culture that they are often taught in small or large groups as a standalone musical experience. Barbershop tags are usually four measures in length, but sometimes can be longer. Within the barbershop culture, tags are often taught by ear, i.e. without printed music, which can be confusing at first. Tags are good material for developing basic concepts of singing and ear training. They’re often taught using a similar sight-reading technique that is used in school music programs, e.g., the scalar number system of 1-8, holding up the corresponding fingers to the scale degree, and/or full chromatic scale of solfege syllables with Curwen handsigns. Tags presented in this section that are in TTBB voicing can be easily accommodated. For SATB (mixed) singers, transpose keys of tags in TTBB voicing up a perfect 4th. For SSAA singers, transpose keys of tags in TTBB voicing up a major 6th. Experiment with keys until you find the right pitches that all singers can sing comfortably. This tag is written in SATB (mixed) notation. For SSAA, use the key of Ab; for TTBB, use the key of Eb. This tag is written in TTBB notation. For SSAA, use the key of G (all voices start on G); for SATB, use the key of D or C (all voices begin on D or middle C). This tag is written in SSAA notation. Note the potential for imbalance in the Tenor part; a recommendation is to have fewer singers on Tenor. Note also the cued pitches, which is the original notation for TTBB voicing, but revoiced here for SSAA. For SATB, use the key of C (Bass and Tenor begin on C4, Lead on E4, and Tenor on G4). For TTBB, use the key of Ab. SATB and TTBB voicings should use the cued notes. For more information about adapting arrangements for mixed or SSAA voices, please contact education@barbershop.org.